Goodgame Empire is an online browser game developed by Goodgame studios who is also the parent of Goodgame big farm, Empire Four Kingdoms and Legends of Honor. This medieval game let you assume the role of a medieval ruler. The story begins with a large plot of land that your family has conquered. You have taken over this piece of land and as the ruler of this plot of land, you are tasked to develop the land. Build woodcutter’s hut houses, farms and barracks for resources for your people. Above that, in this exciting online game, you will have to build a strong and merciless army that can assist you in your future conquest. As your people grow, your land becomes saturated. You and your righteous subjects have to extend the borders of your land through different conquests. At times, you may be greeted by some characters knocking on the gates of your castle. They may be refugees who are in need of shelters or they can be merciless bandits that threaten your people. Have your fearless army on standby in this real-time strategy game. The objective of playing this strategic online game is to outwit, outplay and be the strongest empire amongst all. To do that, you have to rage war and conquer multiple empires for expansion. However, in the early stages of this browser game, more emphasis was given to the building of a lucrative economy. In-fact this is crucial throughout the game play. In Goodgame Empire, resources are used to feed your people and expand your army. This medieval game, has a synergistic combination of strategy, building and wargaming. Players can divert resources and forces to complete side quests to earn rewards. Every player has their own unique playing strategy but ultimately everyone aspires to build the strongest empire. Like all mmo games, you can form an alliance with other players to tap into their resources and support each other in battles. Unity is strength, in Goodgame studios all-time favourite war game. Goodgame Empire has a rather complex game play compared to other action games. In this social game, all players begin with a single city. In the city, the interactions with the NPCs (Non- Player characters) are simple and informative making every quest really easy to comprehend. This online game picks up speed pretty fast. However, in the initial level, you may find that the game proceeds rather slowly, all with the purpose of imparting the basic controls and game play to the player. Grinding wood, pelletising stones and harvesting food have become the necessary actions of the game. As the city slowly builds up and the resources harnessed, the players will begin to build up a strong army that is needed for battle in this strategy game. 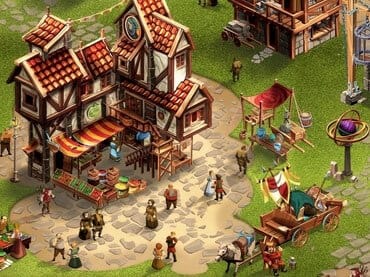 Similar to MMO games like Goodgame big farm, Empire Four Kingdoms and all the other empire games, Goodgame empire relies heavily on a functional economy to generate resources as this game can be resource taxing. Money is acquired through taxation which at first may sound like a piece of good news for you. Yet, taxation and overcrowding have negative effects on the happiness of your people. In order to make your people happy, you have to build more decorative structures and green spaces. The user- intuitive interface makes it really easy for beginners to find their way around. Like all action games, be prepared for an action-packed brutal war fights that will expand your empire. The user interface and graphics are extremely clean and easy to navigate. When playing a game like Goodgame Empire, you will realise that they have simple graphics that are user-friendly. These graphics are sufficient for delivering the exhilarating war fighting experience that you sought for. This video game is also a flash based game based on simplicity and elegance. Here are some golden tips and tricks that could make your gameplay feel like a breeze. There are two types of daily login bonuses. Do not miss these freebies every day when you logged in to this online game. In daily rewards, one can choose amongst the 3 freebies that are offered to you. This free item would definitely be useful in your future battles. There is also Special rewards where you can choose one out of the two rewards. Upon loggin in, you are also entitled to an Alliance Bonus and VIP Bonus, As long as you have an alliance, you will be entitled to this bonus. The higher the alliance level, the better the reward. VIP Bonus only gets activated during VIP mode. The higher the VIP level, the better the reward. Below are the top 10 easiest tasks to achieve within 10 mins. How do we collect specific resource? While sending the attack on travel planning window one can choose the resources that they wish to focus on. In your travel planning, at the bottom right-hand corner, click on “Focus on looting” drop down bar. This will allow you to choose a specific resource for looting. Since this is a strategy war game created by Goodgame studios, you will expect numerous battles throughout the game. When playing this game, always maintain an upper hand against your enemies, you will have to master the spy report and plan the attack accordingly. Below are some battling tips that may serve you well. In conclusion, if you like a strategy game with a thrilling war fight, Goodgame Empire is the game for you. Watch how your empire grows with every strategic decision that you make. It is really surprising that you can get such a nice game without having to pay a single cent. A completely free downloadable game that is worth your time. Yet if you are a person who prefers games are much more fast-paced, you may want to try other action games. If you have questions about Goodgame Empire game, please contact us using this form.